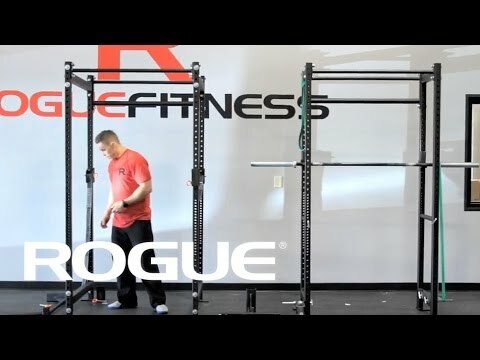 The Rogue R-4 Power Rack is the big brother of the original Westside-inspired R-3 Rack, offering a larger footprint (53” x 53”) and more space inside the rack (43” inside depth). Whether utilized for a garage gym or the elite-level college/pro strength and conditioning format, the R-Series Power Rack is the foundation for a power athlete’s training needs. The standard R-4 features 2x3" 11 Gauge Steel uprights (90" tall) with 5/8” holes in the Westside pattern—1" through the bench & clean pull zone, 2” spacing above and below. It comes equipped with both a 43” Single Skinny and a 43” Fat/Skinny Pull-Up Bar, along with sets of Infinity J-Cups, Pin/Pipe Safeties, and Band Pegs. You can make multiple custom additions to your order using the choices from the drop down menu on this page. Please Note: We recommend securing the unit to the floor before use. A concrete anchor set is available for this process from the order menu. Max Pull-up Bar Height for Fat/Skinny Bar: 78.87"
Max Pull-up Bar Height for Single Skinny Bar: 86.37"
The R-4 is built in Columbus, Ohio, using 2x3" 11 Gauge Steel uprights with 5/8" diameter, laser-cut holes and heavy-duty hardware. The unit is compatible with a wide assortment of Rogue Infinity Series attachments and accessories. For the athlete who needs more space to operate, the R-4 adapts the design of the original R-3 rack with an expanded footprint (53”x53” vs 53”x34”) and inside depth (43” vs 24”). The unit is the same 90” height as the R-3, but the increased depth allows for the inclusion of (2) pull-up bars—a Single Skinny (front) and a Fat/Skinny (back). At Rogue, every weld and every laser cut is inspected individually at each step of the process for integrity and appearance. Every part is again individually inspected for finish after the powder coat process. The entire package receives a final comprehensive quality assurance check before it’s shipped. Once it’s yours, the R-4 is guaranteed by Rogue for Life. Owners of the R-4 Rack can customize their system with the addition of a wide range of compatible tools and accessories. Along with adding a bar, bench, or plates to your order, you can expand the power rack itself with the inclusion of a Rogue Matador, Vertical Bar Hanger, Multi-Grip Crossmember, and more. Even without custom additions, the standard Rogue R-4 Rack comes with all of the hardware and basic accessories necessary to have a pro-caliber power rack at your disposal. This includes all necessary 5/8” bolts and fasteners; (1) 43” Fat/Skinny Pull-Up Bar (with 1.25” and 2” diameter bars), (1) 43” Single Skinny Pull-Up Bar, (2) Infinity J-Cups with protective UHMW plastic, (2) Pin/Pipe Safeties, and (4) Band Pegs. Rogue R-4 Power Rack is rated 4.9 out of 5 by 28. Rated 5 out of 5 by Ant1000RR from Awesome product Super easy to put this rig together took us about 30 min to have all the bolts tightened. Of course it's sturdy as a rock and was built to last. Couldn't be happier. Rated 5 out of 5 by Happy Daddy from Well Built!!! Strong, sturdy and built to last. Bought this unit for my son's birthday and he loves it. Looking to add more attachments in the future. Very impressed with this unit and would recommend to others. The big bonus.....it's AMERICAN MADE!!!! Rated 5 out of 5 by david69 from worth every penny I have had this rack for a couple of years and it is the most used piece I have. I love the fact that it takes all risk of getting hurt from a lift gone wrong away when used properly. This beast is solid and well made right here in good ole usa which is one big reason I bought this. It is expensive but I do not regret the purchase one bit. The only regret I have is not getting one that had the hole numbers etched in the metal but I use tape to mark my most used holes and just count the rest. I bought the spotter arms total waste of money so far I do everything inside the rack and it works just fine. The pin and pipe takes a little getting used to but works just fine and is fast enough to change holes. If money is no object get the r-6 for the storage space. This rack has holes all over the place for different applications like bands and such. Still looks brand new I use it 4 times a week pretty much every week so that lets you know about how well the coating holds up. If your in the market for a well made rack then look no further. Rated 5 out of 5 by craigjohnston3 from Best decision ever Bought this 2-3 months ago to upgrade from a cheapo squat stand I'd been using forever. Was hard to decide to spend the money at first but I'm so glad I did! This thing is a beast and feel indestructible. Plenty of room for my buddies and I to work on it at the same time (which is why I chose this over the R3). 10/10 would buy again if I needed another rack. Rated 5 out of 5 by AlanQ from OVERKILL! Weighs like 500 lbs. Chose over the R3 due to the extra depth. Allows for 2 people to workout at the same time. I can put a flat bench in the middle and me and my wife can lift on both ends without having to change weights, with 2 bars obviously. Same with squats and/or pull ups. Comes with two pull up bars and band pegs making it super versatile. Didn't bolt down have the extra cross member and works great, no wobble. Rated 5 out of 5 by WILDTHING from Exactly what I wanted We have been researching racks for over a year. After testing a few out, we decided to pay a little extra and go with Rogue. We do not regret it. This was exactly what we wanted and have even customized it with a few extra pieces. I love it!